If you’re looking for authentic Mexican food at authentic Mexican prices, La Peñita is the place for you. 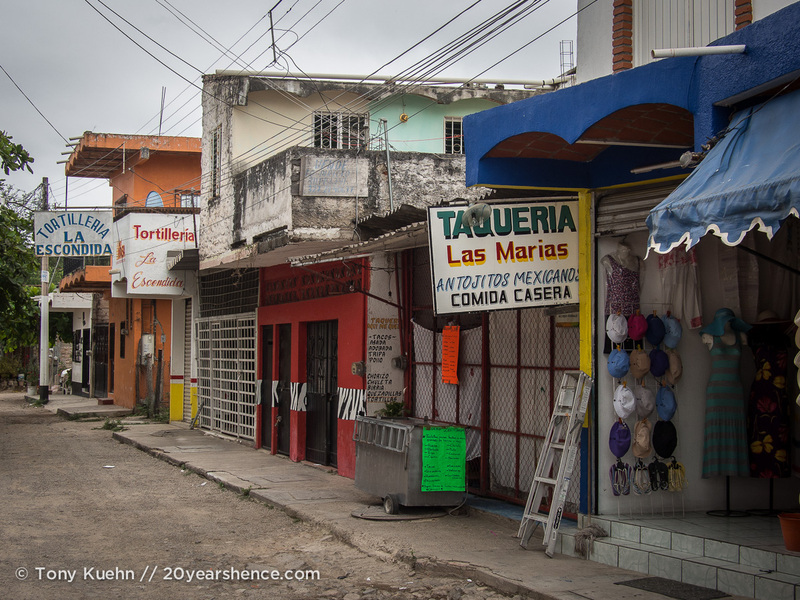 For a coastal town, it’s very affordable and, near as we could tell, the food really hasn’t been gussied up or altered for gringo palates… largely because most tourists tend to base themselves elsewhere. During our month living there, we made it our mission to discover the best places to eat in town. Of course, the downside to La Peñita not really being a tourism hot spot compared to many of its neighboring beach towns in the Riviera Nayarit is that there weren’t many resources to guide our culinary adventures through town; really the only way for us to figure out where and what to eat was through a lot of trial and error. There’s an old saying that you’ve got to kiss a lot of frogs to find your prince, and I suppose the corollary for La Peñita, is that we ate A LOT of tacos (and a few other things too…) in our quest to find the best food there. 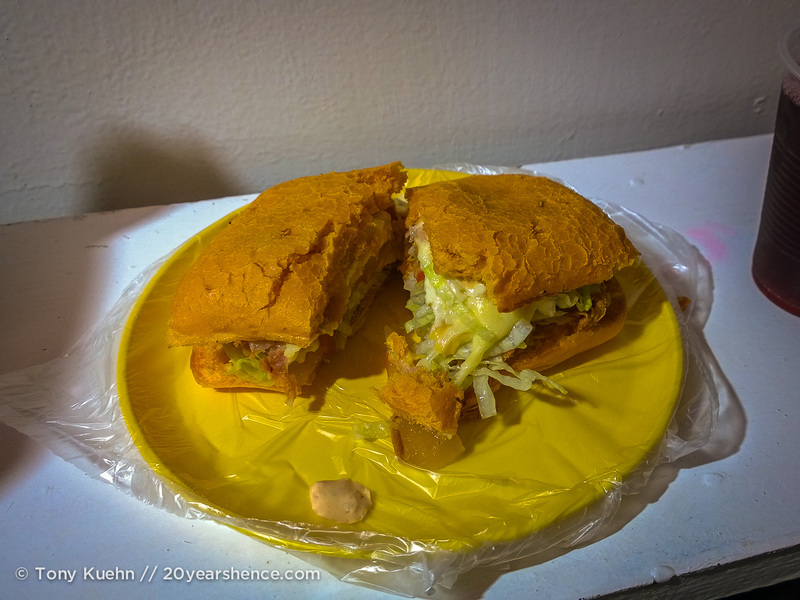 We ate at many of La Peñita’s restaurants (for a small town, food is clearly a priority, and it’s got a lot of places to eat), but I won’t pretend we ate at every one of them or that this is a definitive guide to the food scene in La Peñita. Rather, it’s a collection of the places that we homed in on during our time there and the ones we would recommend visitors or passers-through make a little stomach space for. 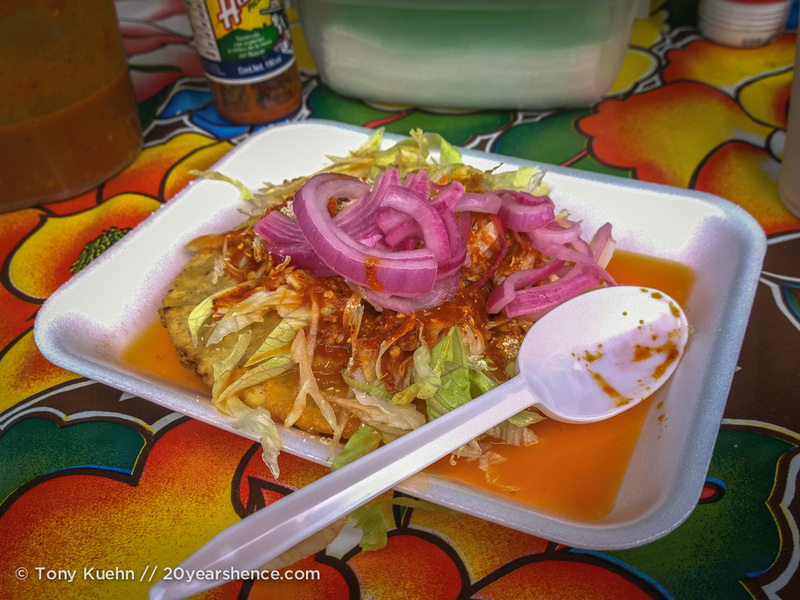 If we were leading a food tour through La Peñita, these are the places we would take you to. By and large, the majority of these places are little holes in the wall or street stalls that are only open for a few hours every day and don’t even have an official name… so, definitely not places you’ll find listed online! Consequently, I’ve organized this guide by times of day so you’ll know the optimal time to visit each place, and we’ve also included a map at the bottom to help you target each location. Easily our favorite place to eat in town, we were initially drawn to Oscar’s taco cart because of the big neon sign proclaiming (in Spanish) “Free Water with Every Taco Order!” Obviously tap water isn’t potable in Mexico, which means that drinks are an added expense at every meal. Most restaurants charge anywhere from $12-$15MX for agua fresca (flavored water)… When your food budget for the day is $150MX, those waters add up! So, free water sounded very good to us and was reason enough to give Oscar’s humble stand a try, but the food and Oscar’s friendly demeanor kept us coming back (he doesn’t speak tons of English, but he spoke slowly to us and worked to understand our rudimentary Spanish). He serves up tacos al guisado, which essentially means his fillings are stewed meats—you won’t want to be wearing white when you visit his stand! The menu is the same every single day: birria (beef stew), chicharrón (fatty pork skin), nopales con costilla (cactus with pork rib), pollo (chicken), and frijoles con puerco (beans with pork). Our favorites were the chicharrón and the birria, and I always appreciated the nopales as well because I’d take any chance to get some vegetables. The fillings are hearty and full of flavor, and Oscar is always generous when he’s assembling your taco. Tacos cost $13MX a piece, and I would normally eat 2 for breakfast, whereas Tony would get 4. I should mention that on our last visit, Oscar’s sign offering free drinks was no longer on display and we were charged $10MX each for our waters. If that’s the case, we’d recommend popping into the Oxxo (popular convenience store chain in Mexico) and picking up a drink from there instead. Location & Hours: Oscar sets up his stand on the main drag, Avenida Emiliano Zapata, in front of the Oxxo store (corner of Bahía de Banderas). He’s there by approximately 6:30am every day of the week and he serves until he runs out of fillings, which generally happens between noon and 1:30pm. Ok, unlike most of the other places we frequented, El Pollito is listed on Trip Advisor, has a fixed permanent location and is well frequented by tourists and locals alike. It’s also open for breakfast, lunch and dinner. That said, if you’re going to eat here, come for breakfast. 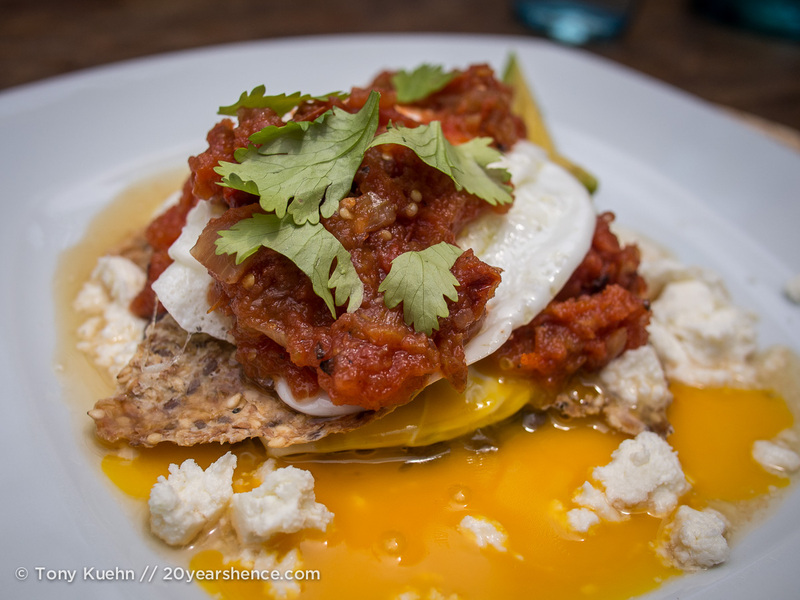 We stuck to the Mexican breakfast dishes, and they were delicious and affordable. Our eggs were cooked perfectly and the ranchero sauce had a good kick to it, as did the tomato-based sauce used in the chilaquiles. Dinner on the other hand, was a mixed bag. I got the fried chicken plate which was fine, but the chicken was a bit dry which was disappointing given the name of the restaurant. Tony’s mixed Mexican plate was a disaster, as the cheese inside the chile relleno was still partially frozen when it was served. Bottom line: Breakfast is good value, but for lunch or dinner, there are many better options around town. 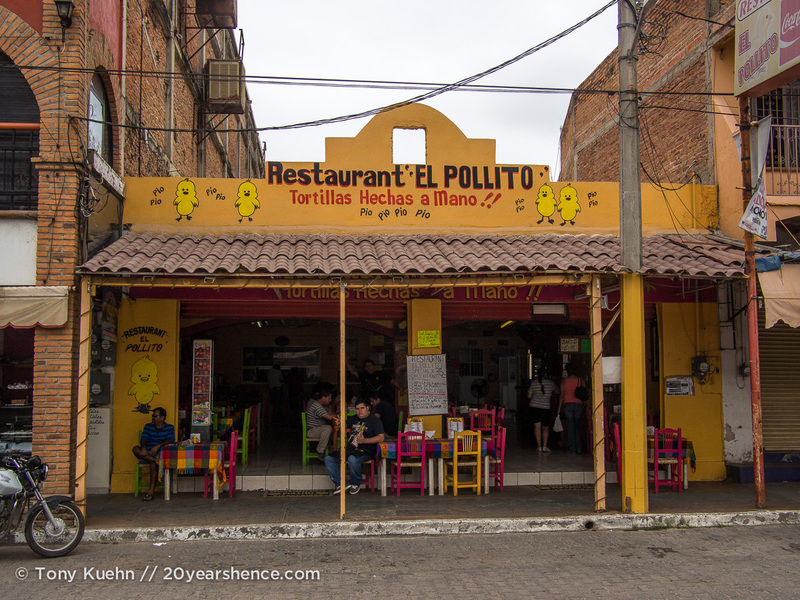 Location & Hours: El Pollito is located at Emiliano Zapata #30 and is open from 7am – 9pm. Our golden rule when it comes to street food is that vendors who only do one thing tend to do that one thing amazingly well. Technically our empanada ladies also do tostadas, but I’d say 95% of their orders are for empanadas and that is absolutely what you should order here. Corn tortillas are stuffed with your choice of queso (cheese), chicharrón, or picadillo (ground beef) and then deep fried. They’re topped with lettuce, slices of radish, and a powdered cheese and your choice of salsas and only cost $10MX a pop. If you’re feeling squeamish, you can skip the fresh veggies, but we ate here a bunch of times and never got sick once; turn over is high as are their hygiene standards. 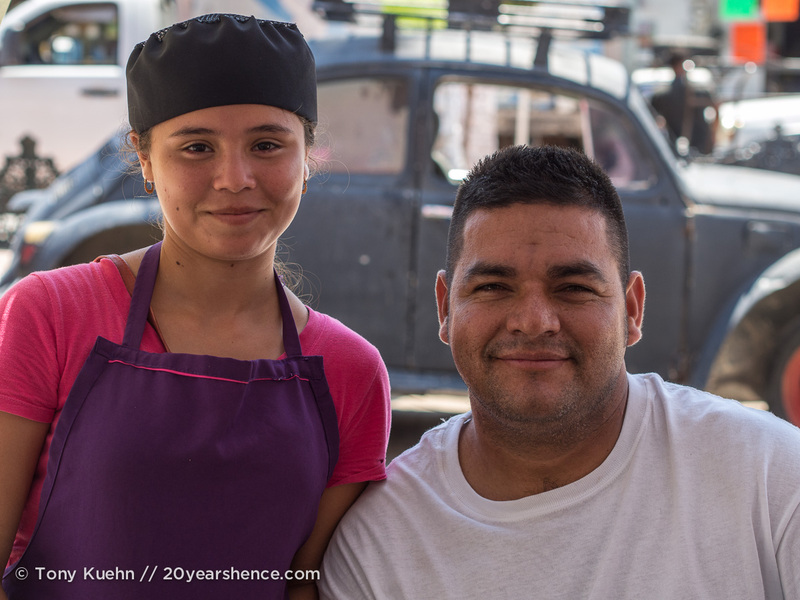 Location: You can find the empanada ladies at the corner of Emiliano Zapata and Bahía de Guaymas (look for Lonchería Vicky). They are there from about 10am – 2pm every day. We always try to support local businesses when we travel and it doesn’t get more local than this family run place, which is little more than a few plastic tables and chairs set out curbside. The food is some of the best in town and is very affordable, and the people cooking here are so lovely. They offer taco dorados (tacos that are fried so that the tortilla is crispy), quesadillas, enchiladas, and gorditas with a wide variety of fillings, including all-too-rare vegetarian options like frijoles (beans), queso (cheese), and rajas (poblano pepper). To our knowledge, this is the only place in La Peñita serving up gorditas, so that’s what we came here for… and we came here often. 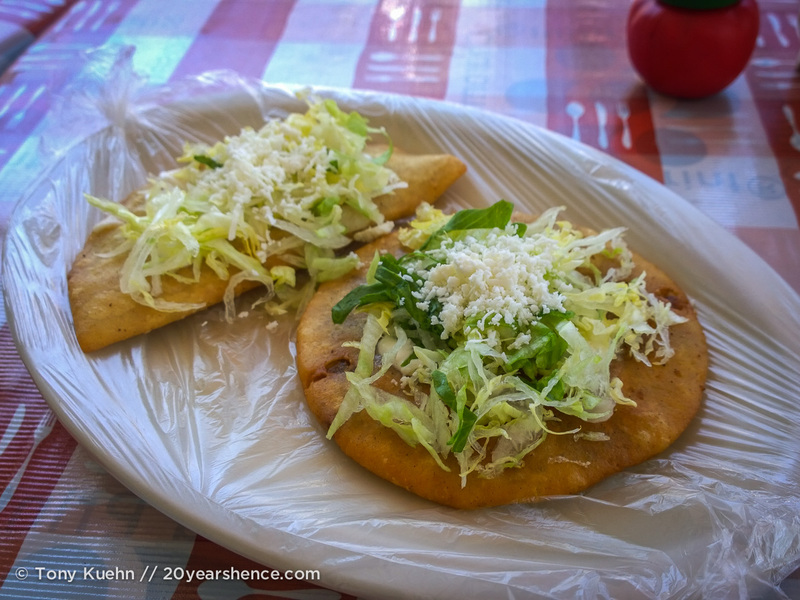 Gorditas are essentially little corn flour discs that are stuffed with a filling of you choice, fried, and then topped with lettuce, radish, powdered cheese and salsas of your choosing. Our hands-down favorite here was the chicharrón gordita, stuffed with crispy little nuggets of porky goodness; the first time we ordered it, we got one to share and then each ordered two more! That said, the enchiladas here, both the cheese and the chicken, are excellent as well (something I don’t say lightly, as I tend not to really care for enchiladas!) and make sure you get an agua fresca too—the grande is enough to share and is one of the best deals in town. Location & Hours: Located at the corner of Emiliano Zapato and Bahía Punta de Mita, look for the white building that contains a carnicería (butcher shop) and you’ll find this place. Try to get here by 1pm as they tend to close early. Another brick & mortar restaurant that is popular with both expats and locals, Casita de Irma serves up comida casera (home-style food) for breakfast, lunch and dinner. We only ever came by for lunch, however. 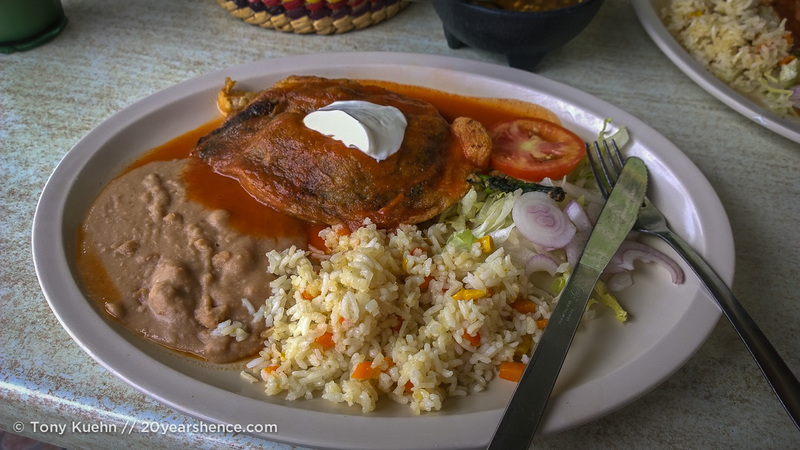 Irma’s has an extensive menu, but the thing to order is definitely the chiles rellenos, which are not only delicious but are also the best value on the menu. For $45MX, you get a poblano pepper that is stuffed with cheese, dipped in an egg batter and deep fried, served alongside “salad” (in Mexico this always just means some leaves of iceberg lettuce, radish, onion and tomato), rice and beans. For $60MX, they’ll stuff some shrimp (camarones) into your pepper too! At $15MX, their agua frescas are a bit pricy, but they change daily and are fresh and really tasty; they’re the perfect accompaniment to wash down your meal. Location and Hours: Casita de Irma is located at Bahía de Manzanillo and is open from 8am – 9pm. We ate here our very first night in La Peñita and came back no fewer than three times per week for the rest of our time in La Peñita. The amazing smells wafting off of Balthazar’s charcoal grill set outside of this corner-side restaurant were impossible to resist, and Baltha’s warm welcome sealed the deal (even when we didn’t eat there, he’d always wave and holler hello when he saw us walking by!). This was undoubtedly the place we ate dinner at the most frequently during our stint in La Peñita. You can get tacos, quesadillas and pelliscadas (essentially an open-faced quesadilla with a thicker tortilla) here and not one of them is a bad choice. Fillings are either carne asada (grilled steak), chorizo (sausage), or adobada (marinated pork). Get the carne asada: it’s the best in La Peñita and we’ve yet to have better anywhere else in Mexico. I’ve often found that carne asada can be quite dry, but Baltha’s carne asada was always juicy and flavorful. They also have a great selection of salsas and condiments to top your tacos with, from beans to pickled cactus. 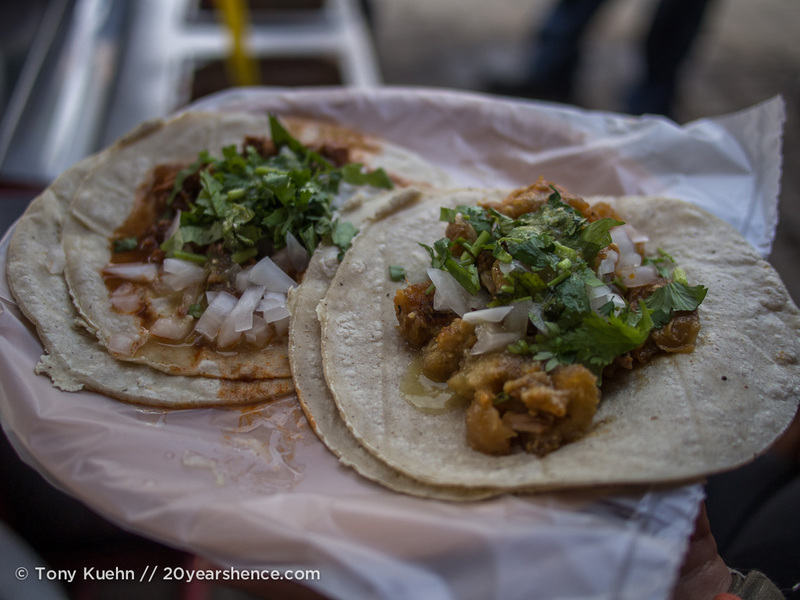 Tacos cost $13MX apiece and are the biggest tacos on offer in La Peñita—two were more than enough for me most nights for dinner; Tony would normally get three. If either of us was especially hungry, we’d order a quesadilla, which is HUGE and definitely big enough to split. It’s also worth trying their cebada agua fresca,which is kind of like horchata, but is made from barley and tastes like the left-over milk in your cereal bowl. 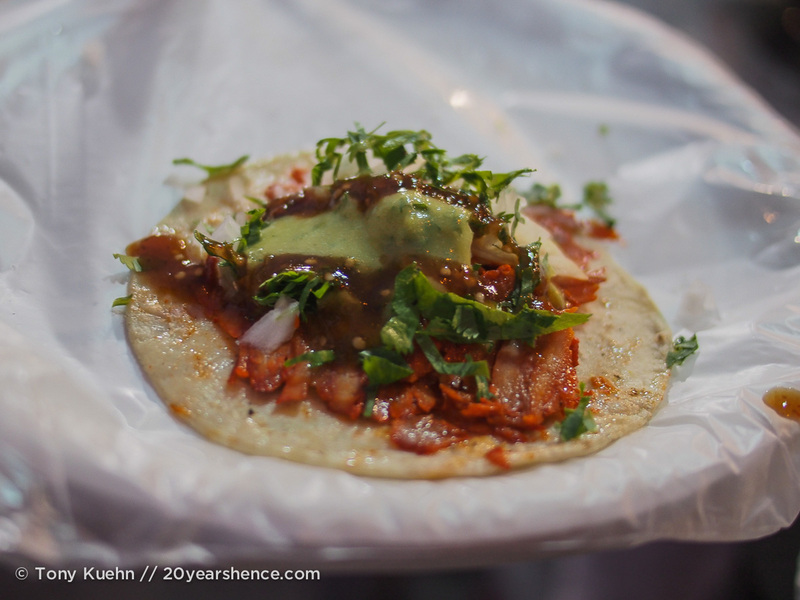 Probably the single thing I was most excited to eat when we arrived in Mexico was tongue tacos. So you can only imagine how frustrated I have been that hardly anyone seems to serve tacos de lengua! 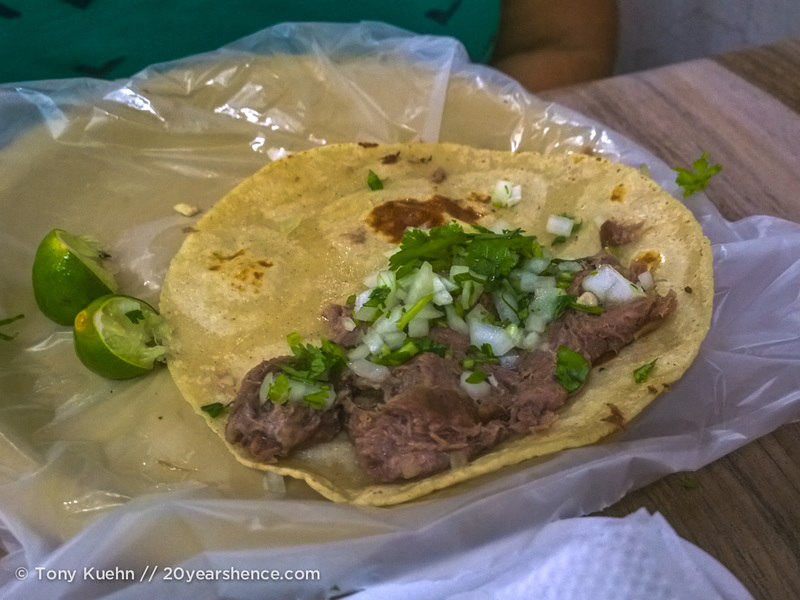 Of the many taco joints in La Peñita, we only found one place that offered lengua… but if you want it, you’d better get there early because they sell out fast! We first ate here because a random old man on the street called us over as we were walking by and told us very emphatically that they make the best tacos in town. I was immediately on board when I saw that they had tongue, and they did not disappoint: The meat was rich and melt-in-your-mouth tender and brought a huge smile to my face. If you really want to walk on the wild side, their tripa (tripe) is also very good, just slightly chewy and with a subtle smoky flavor. The tacos and quesadillas are large and prices vary based on the meat that you choose. It’s clear that this place is incredibly popular because it is always packed to the gills, and it’s one of the few places in town where you may have to wait to place your order and grab a table… but the wait is always worth it! Location & Hours: Our lengua taco place is just across the street from Baltha’s taco shop, on the other side of Emiliana Zapata and Bahía de Banderas under the “El Studio” sign. They start serving around 6 pm and continue well into the night. If you want tongue (and you do! ), get there before 7! By the time we discovered las Marias, we were looking for places in town that did something a little different than just your basic tacos or quesadillas, because we felt we already had those bases covered. Las Marias offers a large list of Mexican street food—of course they offer the usual suspects of tacos, quesadillas and pelliscadas, but they also offer volcanes, gringas, and huaraches. As we learned, however, all of these dishes are essentially variations on a theme, even if Mexicans try to tell you otherwise! 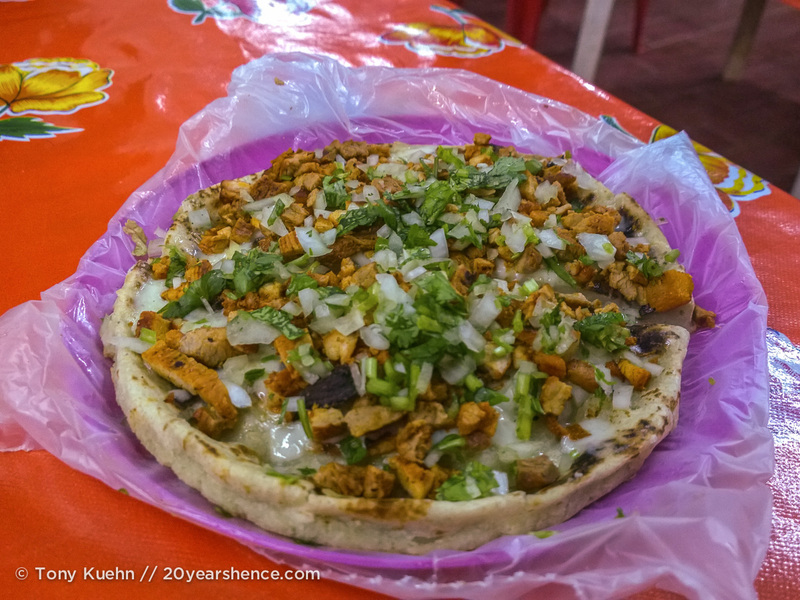 Huaraches are just football-shaped pelliscadas, and gringas are just crispy tacos, and volcanes (also known as vampiros) are essentially an open-faced gringa. Sigh. ANYWAY, las Marias offers every permutation of these tortilla-based dishes, but what really sets them apart is their protein selection and their fixins. They have the biggest selection of meats on offer (though they won’t necessarily all be available every night), including fish, shrimp and chuleta (smoked porkchop). Definitely order the chuleta, however you choose to eat it. As for the fixins, they have a wide variety of salsas and toppings, including shredded cabbage (A vegetable?!? Hallelujah!). Location & Hours: Taqueria las Marias is located on Bahía de Guaymas. They open around 6pm and continue cooking late into the night. 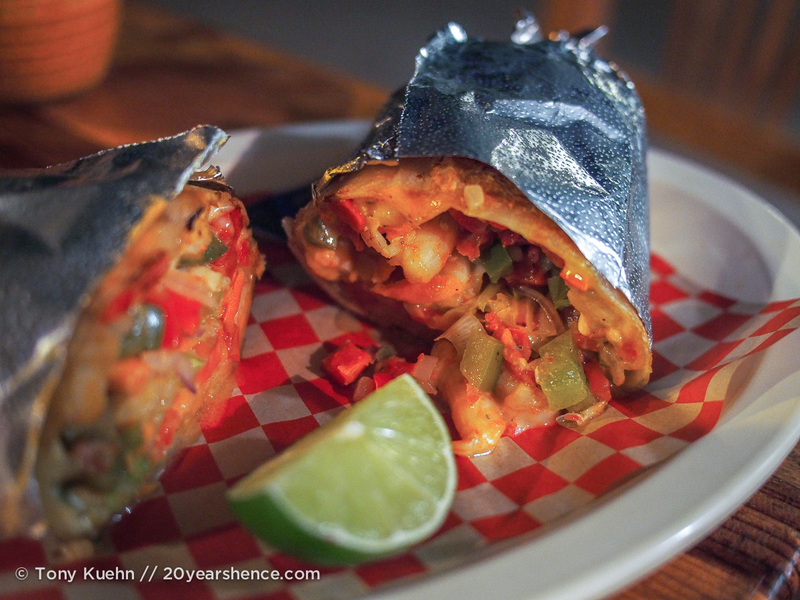 When you get tired of things wrapped in corn tortillas, as you inevitably will, never fear! The torta movil is there to save the day. A bastion of late-night revelers, this sandwich truck serves up hearty sandwiches and burritos for $45MX or less. We stuck to the sandwiches, where you not only get to choose your protein (pork, chicken or beef) but you also get to pick from a selection of artisanal breads as well. We always splurged the little bit extra to get pineapple included on our sandwiches, and we recommend you do too! Location & Hours: Torta Movil parks on Bahía de Banderas and starts setting up around 8 pm and serves until 2 am. They are closed on Wednesdays and Thursdays. Consider us converted! Not only are the tacos here delicious, they’re also some of the cheapest eats in town! Whether you order fish or shrimp, each taco only cost $10MX apiece. They are smaller than most of the other tacos in town, but at that price, you can afford to eat four or five without breaking the bank. Location & Hours: Hinde y Jaime is at Emiliana Zapata #57 at the corner of Salina Cruz. They are open from 9am to 9pm. Unless you’re looking for Italian food, Las Brisas is the #1 rated restaurant for La Peñita on Trip Advisor, so chances are you would find it without my help, but I’m still going to mention it. It’s open for lunch, but smart diners will come here for dinner because certainly one of the allures to dining here is the spectacular sunset you can enjoy alongside your meal. Las Brisas is one of the more expensive restaurants in town as it’s incredibly popular with the expat population (and hey, you’re going to pay for the view), but one tip to help you save money is to order the surf & turf fajitas and split them. 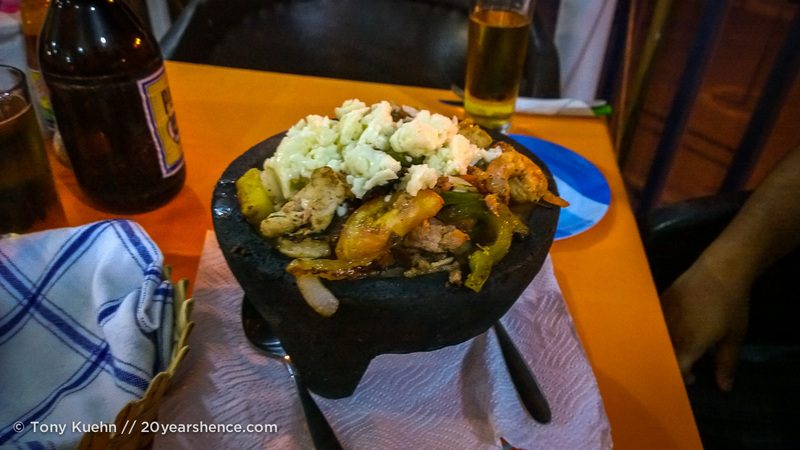 You’ll be delivered a huge stone cauldron of bubbling chicken, beef, shrimp, BACON, cheese, veggies and FLOUR tortillas (such a treat after weeks of corn tortillas) that is big enough to serve two or even three people. It’s a splurge for sure, but you won’t be disappointed. Location & Hours: Las Brisas is located at the very end of Emiliana Zapata, #61, right at the beach. It’s open for lunch and for dinner. Does the thought of eating any more Mexican food cause your appetite to vanish? Don’t worry—we understand how you feel. There aren’t tons of international options in La Peñita, but here are two places we tried that did the trick. 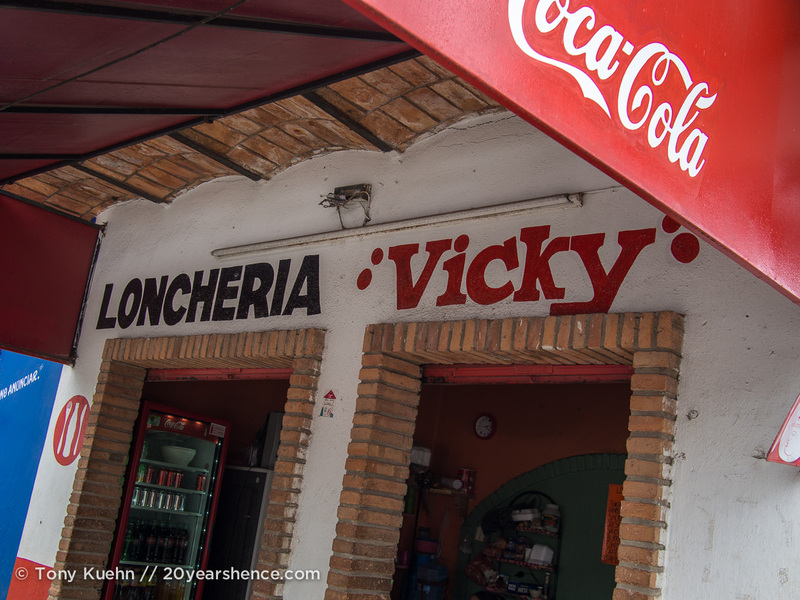 For our first two weeks in La Peñita, Tony kept suggesting we give the “scuzzy little Chinese restaurant” in town a chance. For two weeks, I rebuffed him. And then, when the thought of eating another tortilla made me lose my appetite, I caved and we gave Zong Sheng Express a try. We then proceeded to eat there practically every other day for lunch or dinner. Let’s be clear: Zong Sheng Express is not authentic Chinese food, but that doesn’t mean it’s not tasty. When our palates desperately needed some different flavor profiles, Zong Sheng delivered and we were very grateful for its fried rice and beef with broccoli (vegetables!) and spicy chicken with celery (more vegetables!). We would split the rice with 3 sides for $65MX (and sometimes still have leftovers) because the portions are ginormous. Skip the spring rolls though, unless they’re fresh out of the fryer or you are desperate for more veggies. Location & Hours: Zong Sheng Express is located on Emiliana Zapata between Bahía Punta de Mita and Bahía de Manzanillo (although they are opening a second location on the other side of the street…). They are open from about 10:30 am (if not earlier) until late at night. Even though La Peñita is on the ocean, I was still dubious about trying sushi there. But positive reviews from other travelers and an intense craving for something different prompted us to toss our fear of food poisoning aside and decided to give Hanami a go. Hanami is probably the swankiest place that we dined at in La Peñita proper. Someone has clearly poured a lot of money into the place and it’s a great place to kick back for an evening when you’re looking for a slice of elegance in dusty little La Peñita. 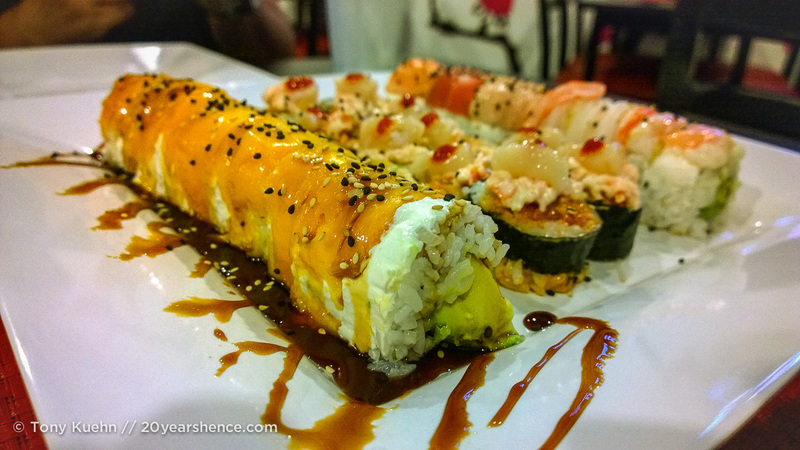 The sushi features some interesting combinations that remind you that you’re dining in Mexico, from including mango and jalapeño in certain rolls, and an extremely heavy hand with cream cheese. The knife work and preparation of the sushi didn’t have the finesse that I am used to seeing at sushi restaurants, but that said, the fish was fresh and everything tasted really good. Of course, sushi isn’t really cheap anywhere, not even in La Peñita, so dining here definitely constitutes a splurge. But if you have to eat some sushi, you could do worse than Hanami. Location & Hours: Hanami Sushi Bar is located at Calle Baca Calderon 6B and is open from 1:30pm – 11:30pm. If you have a car or are willing to take the bus to visit some of the other beach towns along this stretch of coast, we found that some very good eats can be had. 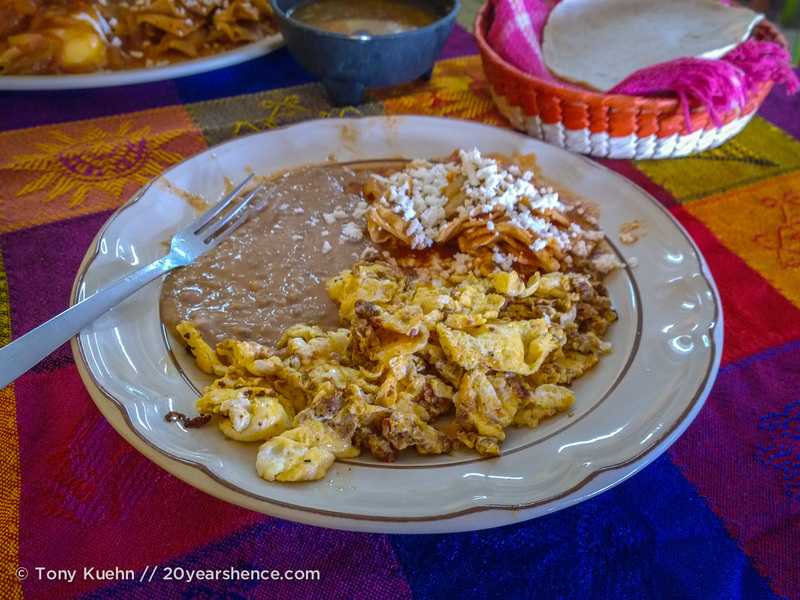 We limited our explorations to the towns of Sayulita and San Pancho, which provided us with a nice change of scenery and some really great meals. If visiting Sayulita, San Pancho or any of the beach towns south of these two towns, there is a time difference. La Peñita is one hour behind these places. 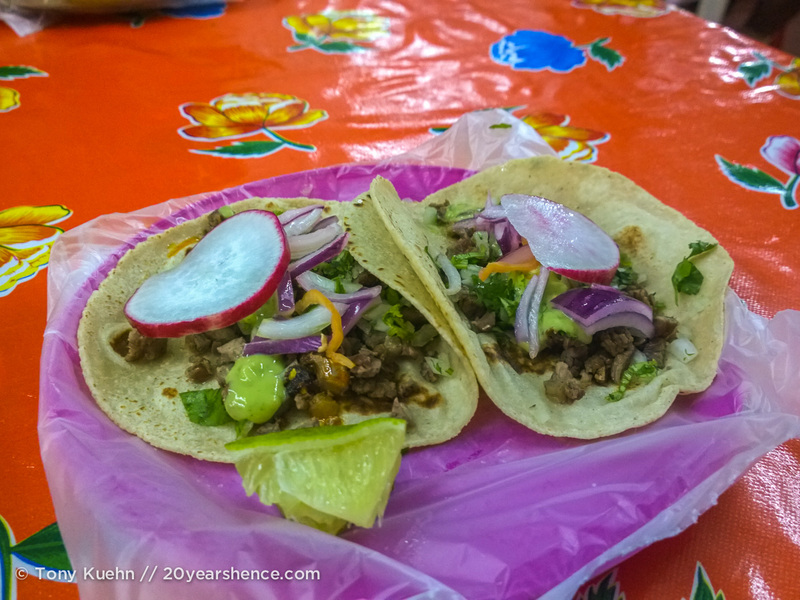 We only spent one afternoon in Sayulita and had mixed feelings about the town, but we definitely appreciated the wide selection of dining options on offer. We did find food more expensive there, but using this guide of where to eat in Sayulita, we decided to eat at Yeikame for lunch. They have some pretty great lunch specials where you get a main plate, their famous blue corn tortillas, and an agua fresca for $60MX. Tony ordered the barbacoa a la Vera Cruz, whereas I ordered the carne a la mexicana; Tony definitely won lunch as his meat was wonderfully tender and in an incredibly rich sauce full of deep flavors. Mine was tasty, but a lot more basic and one-dimensional in its flavors. On some level, however, we both won because the blue corn tortillas here really do live up to their reputation and the agua fresca of the day was a lime & mint combination that tasted like a mojito without the booze. There are also quite a few vegetarian & vegan-friendly options on the menu here as well. Location & Hours: Yeikame is located at Calle Jose Mariscal # 10 and is open for breakfast, lunch and dinner. 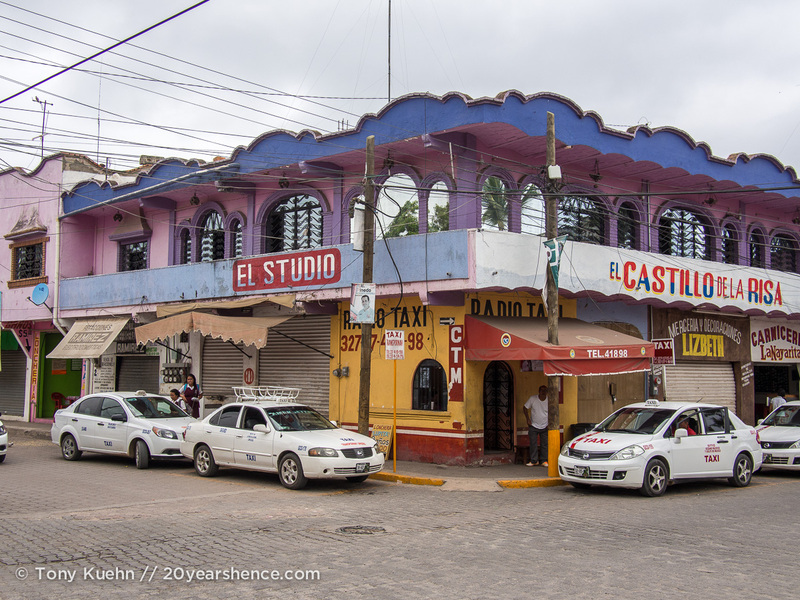 Just five miles north of Sayulita, San Pancho was a lot more laid back than Sayulita (we remarked that it is likely the Sayulita of 10 years ago) and far more our speed. It also had the benefit of being just a tiny bit closer to La Peñita, so we visited not once but twice, both times with eating on our mind. On our first visit, we drove to San Pancho specifically to have breakfast at Bistro Organico which is inside the Cielo Rojo Hotel and has a predominantly vegetarian and vegan menu. 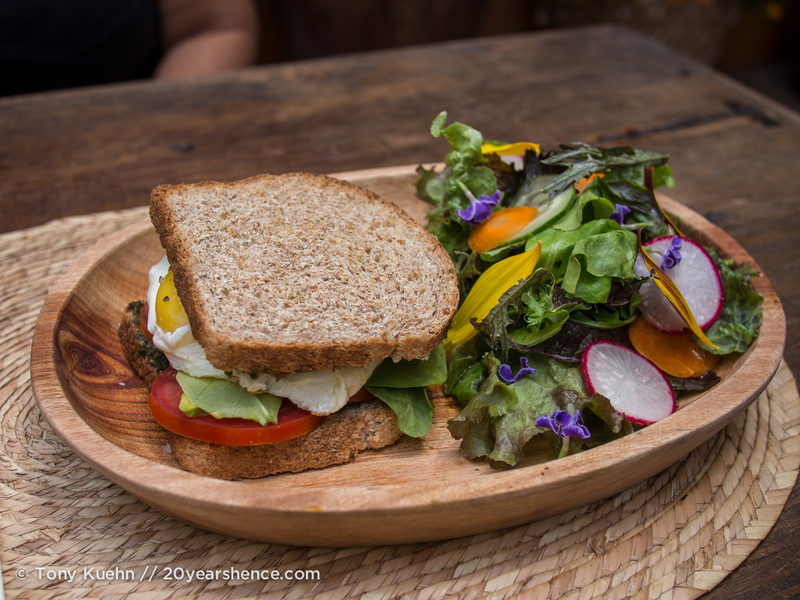 I knew I wanted something with a ton of leafy greens and pounced upon the Sandwich Toscano which featured, amongst other things, avocado, sprouts, a perfectly cooked egg and PESTO, and came with a side salad that was almost too pretty too eat. (Almost.) Tony went with the huevos rancheros, which were beautifully prepared, and we accompanied our meals with fresh coconut water. Make no mistake, this is “rich white people food” for Mexico, but it was exactly what we needed—healthy and full of veggies; we gobbled our food down with huge grins on our faces. Bistro Organico is located inside Hotel Cielo Rojo at Calle Asia #6. Breakfast is served from 8am-2pm every day of the week, and dinner is served from 6pm-10pm Tuesday through Sunday. 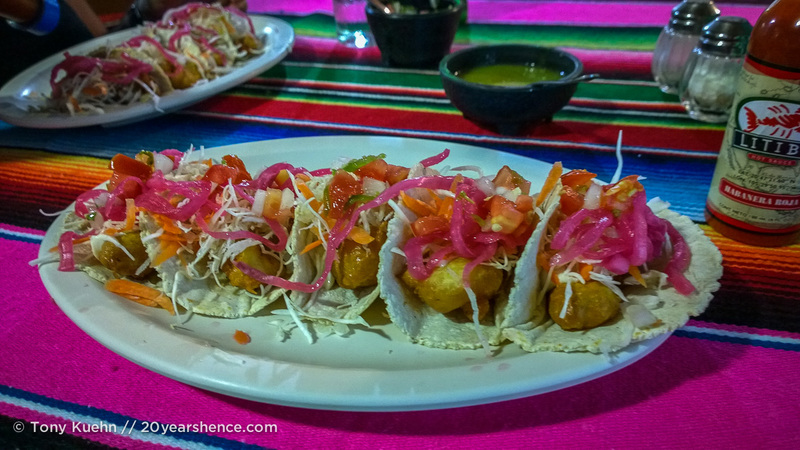 On our last evening in La Peñita, we decided to drive down to San Pancho for our final hurrah. After a disappointingly cloudy sunset, we strolled down the main street and grabbed two tacos al pastor at an al fresco taco stand, unable to resist the spit of sizzling meat topped with slices of grilled pineapple. We hemmed and hawed over where to eat, but ultimately settled on Barracuda, reasoning that our last evening on the Pacific coast (for now) should feature some fresh seafood. To that end, Tony ordered a shrimp burrito, and I ordered a “shrimp hamburger”, which was essentially garlic shrimp piled onto a toasted bun with fresh veggies and a side of fries. This was not a mistake! The food at Barracuda was, I daresay, orgasmic; it took all my self-possession to refrain from the table-pounding scene à la When Harry Met Sally. The food was so satisfying, and the fries—which I was initially disappointed by because they just looked like stodgy potato wedges—were amazingly crispy and honestly some of the best fries I’ve ever had (the incredible array of dipping sauces—like chipotle mayo and habañero mayo—didn’t hurt either!). Although we were stuffed after finishing our mains, the food was so good we knew we had to make room for dessert: coconut flan. It was the perfect sweet finish to our simple yet decadent meal and is one we still talk about fondly. 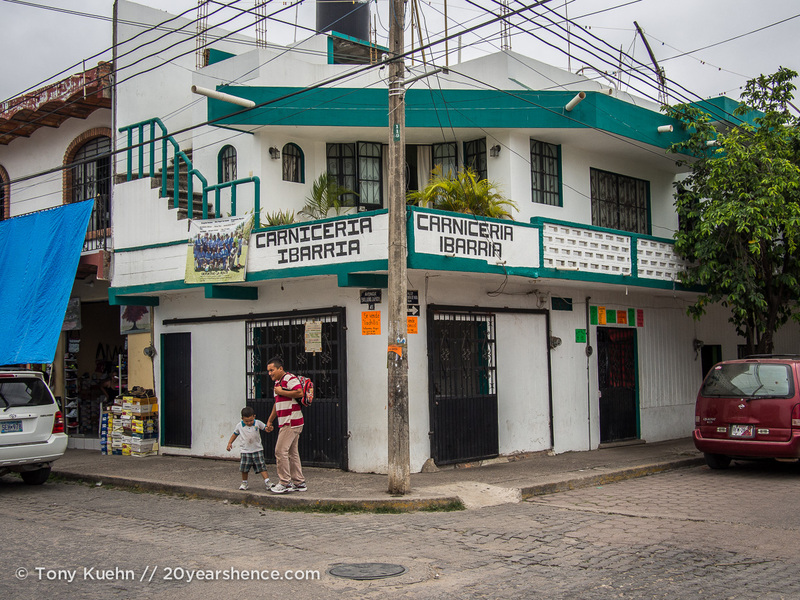 Barracuda is located on San Pancho’s main road, Av. Tercer Mundo Esq. and is open for lunch (11:30 – 3:00) and dinner (5:00 – 10:30pm; later on weekends). I wants ALL. THE. FOOD. I actually found a company that MAKES tortillas and taco shells here in Saigon. I’m going to see if they’ll sponsor a Taco Duck party… I’m being serious. The food got a bit repetitive after awhile, but it was all really well done, super affordable, and now that we’ve had some distance from it, there are definitely a few vendors whose food we really miss! Funny how food can really make or break a destination! Sarah recently posted..Journey to Shine begins tomorrow! Steph! I have the distinct feeling that you wrote this post with the sole purpose of getting back at me for writing my recent Indonesia food post. You’ve succeeded in making me really jealous of you. How about this, I’ll trade you a corn fritter for a taco! 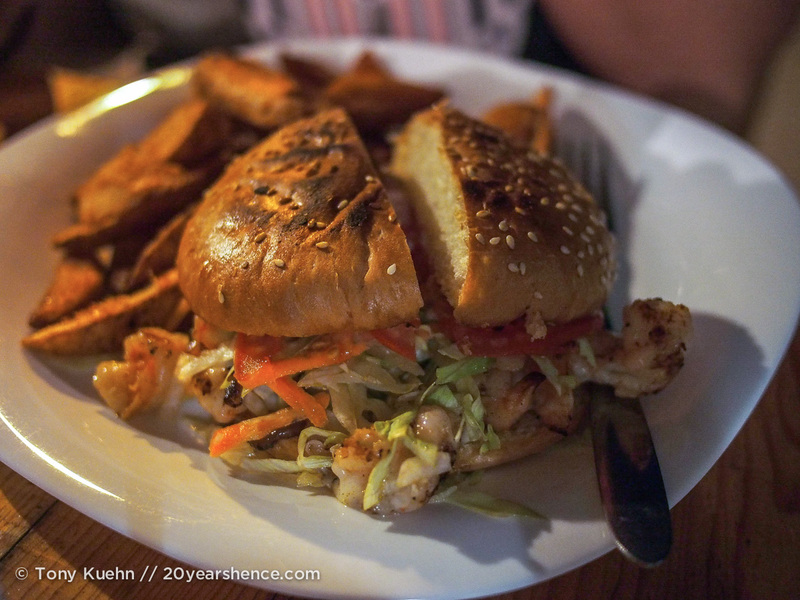 You guys always ALWAYS have the best food roundups! My mouth is watering Happy Cinco De Mayo — where will you be for the celebration, and more importantly, what will you eat?! One of the best things about Mexican food is how delectably fresh it can look when served up – the colours are a riot. You’ve really captured these pics well – I want to go now!! 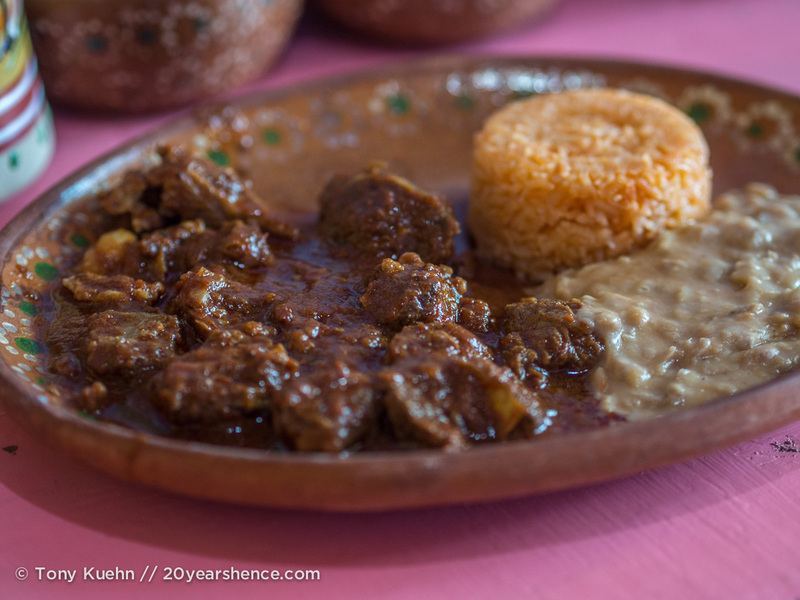 Not all Mexican dishes are created equal—some feature an awful lot of brown, which can be hard to photograph, even if the dish is delicious!—but when they get them right, they really get them right. If you haven’t visited already, you definitely need to! Sweet baby Jesus. I knew this post was going to torture me, but I didn’t realize how BADLY I’ve been craving Mexican food until this very minute. I was practically in tears by the time I got to the fish and shrimp tacos. NEED! I think the grass is always greener when it comes to food—when we were in Asia, we definitely missed Mexican food the most out of any kind of cuisine, but of course, now that we’re here, we miss Asian food! (Really, I miss the light fresh flavors of Asian food… Mexican food is VERY rich and the amount of meat we are eating here seems insane compared to the more abstemious Asian portions.) But yeah, you can never go wrong with fish or shrimp tacos… especially when you’re right by the ocean! What a Mad Mad Post!! So much Food!!! I am so hungry right now even though I have just had my lunch! Ha ha! Yeah, these are pretty dangerous posts… I really need to include a disclaimer at the start warning people not to read on an empty stomach! Glad to see you guys are eating well I hope you’ve settled into your new life a bit more now? Yes, we are definitely not going hungry here in Mexico, that’s for sure! There is so much meat though that I find myself eating vegetarian at any opportunity which, granted, is not very often. Of all the places we have traveled, Mexico is probably one of the hardest places to be a vegetarian unless you self cater. We are definitely drinking a lot of fruit smoothies because the fresh fruits here are really fantastic! And yes, we are definitely feeling a lot more comfortable now that we’ve been here for nearly 2 months! I’ll need to write a post about our latest destination—it’s definitely more our speed! I like that you cited a recommendation at each spot. I’m sure it It will help us out a lot when we need to eat in late Feb 2016. We’re going to stay at Bahia Hotel, it is in the area of those restaurants in La Penita. I hope you find the food guide useful, Ruth! I think in countries like Mexico, restaurants/food stands tend to do a particular thing especially well (even if they offer more than one food option) and so it would be a shame for someone to visit somewhere we recommend and not order the right thing. If you do try out some of these places, please let us know what you think! We are fellow Canadians from the east coast, PEI and really looking forward to our vacation. We’re going to be there for 6 days. The fact that we sprint (not really, just really fast walkers) to cover and explore a lot of territory until 5pm each day when we normally slow down to eat and drink. We want to be sure we have a recommend…it gives us a place to start. What a wonderful post on La Penita. Can’t wait to go to Tacos de Baltha to try the carne asada.